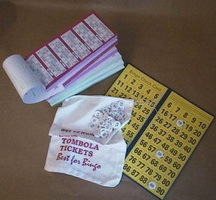 Bingo is a popular game combining skill and chance. Players around the world enjoy it, from a wide variety of age groups and backgrounds. Yes, it is a stereotype that only old women play bingo, but there are a substantial number of younger men and women alike who enjoy the game as well. Bingo rules and tips are relatively simple. In the game of Bingo, there is a caller who is responsible for drawing out numbered balls (between 1 and 75) randomly from a rotating bin. He calls out the number he has selected and players then has a few moments to find the given number on their Bingo cards and mark them off appropriately. The Bingo cards usually are arranged in a five-by-five pattern of rows and columns, and the numbers are random (the number of possible combinations is enormous). The columns are titled with the individual letters spelling out the word "Bingo", and each column has fifteen numbers from which to choose. "B" has the selection between 1 and 15, "I" has the selection between 16 and 30, "N" has between 31 and 45, and so on. In Britain and Australia, the number pool may be up to 90, but 75 is the typical American limit. As the numbers are called off, players mark them on their cards as they find them. The winner is the first person to create a pattern on his card with the corresponding letters. There are many possible patterns, such as a straight line down one side of the card, or a diagonal line through the center. Other variations (depending on the rules of the particular game) may include filling in the borders of the Bingo card, or creating the shape of a letter, such as "Y" or "C" on the card. The winner calls out "Bingo!" to the caller loudly enough to be heard, and his card is then inspected to ensure validity. Bingo has relatively simple rules, but is primarily a game of chance. Because of this, it is impossible to play the game with a detailed strategy, but there are still some tips for players to try. If you are playing primarily to try to win money, sometimes it is a good idea to purchase more than one Bingo card per game. If you can comfortably monitor several Bingo cards, you stand a greater chance of getting a winning solution. This potential is even higher if you choose to play Bingo on slower days or nights, with fewer people. When there are fewer people playing, there are fewer cards in distribution and you have a greater chance of holding the winning card. You can also try to arrive early and promptly purchase your card or cards. Sometimes the smaller numbers are grouped together in the first several cards, allowing you to keep track of your progress more easily. Longer gaming sessions tend to have numbers grouped together in spurts, so you may have an extra chance to find a winning solution. In general, players should try to be courteous to the other players around them. Avoid yelling out "Bingo!" louder than necessary to get the caller's attention. The game is usually played in a relatively quiet atmosphere for players to concentrate, so it is best to leave younger children at home when playing together at a Bingo room. 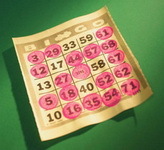 In addition, players should avoid prematurely calling out "Bingo!" If you are not sure, wait to call until after you have made sure that you have a winning solution. With a little common courtesy and gaming etiquette, Bingo can be enjoyable for everyone playing.